Ever since starting my transition to natural hair, I have been learning a lot about the best way to care for my hair. One of the things I learned about was Cowashing. What does the term cowashing mean? Basically it's the abbreviated term for "conditioner washing" where a conditioner is used to wash your hair instead of shampoo. For my curly girls out there who have dry hair, this could be your answer. Because our hair is curly, it takes longer for the natural oils from the scalp to spread through the hair follicles, and if you shampoo your hair often, you are stripping the hair of all the oils without even letting them nourish the hair. This contributes to the dryness and health of the hair. When I first read about this, I wasn't sure if it actually works because I've always shampooed and then conditioned my hair. I usually wash my hair twice a week so I started off by replacing my midweek wash with a cowash, and before I knew it I was cowashing all the time because I fell in love with it. Unfortunately, cowashing doesn't get all the residue out like shampoo does, so it is important to occasionally shampoo your hair even if you stick to cowashing. With the beauty industry constantly evolving there are special cowashing or cleansing conditioners available but I think regular conditioners work as well. I usually use the Tresemme Naturals or the Herbal Essence Hello Hydration to cowash and depending on the day and amount of time I have I would either deep condition or use the Aussie 3 Minute Miracle. 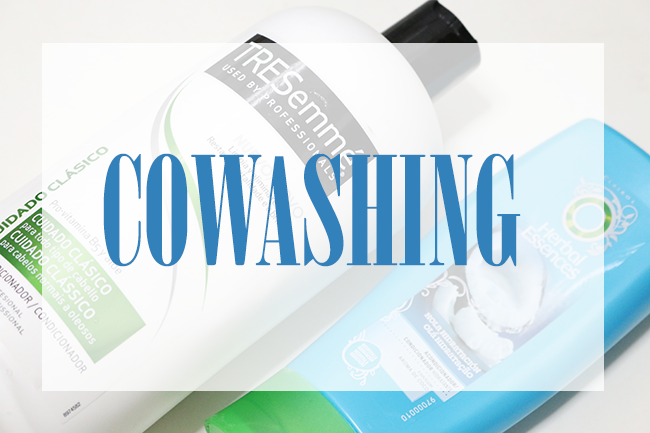 Cowashing can benefit any hair type be it straight, wavy, curly or coily. If you have straight hair, I'd suggest alternating between shampoo and conditioner. Your hair will be a lot less dry and will look a lot healthier. It works so well I've even gotten hubs to love it. For other hair types, I would suggest starting off slowly and then replacing your regular wash days for cowash days. After a while, you'll be able to find a system which works for you. I find that cowashing twice a week is working really well for me and my hair looks a ton better. I want to try a cowashing/ cleansing conditioner just to see what all the fuss is about and if there is any difference between regular conditioners or cowash conditioners, so if you have any suggestions, please let me know. Have you tried cowashing? Let me know what conditioners to try.